Climate Change is Real…or Why Our 15th ENERGY STAR Partner of the Year Award for 2017 is the Most Important One Ever. 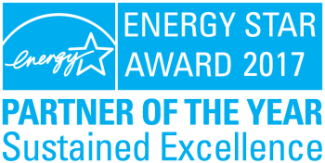 We are pleased to announce that Servidyne has been named a 2017 ENERGY STAR Partner of the Year – Sustained Excellence Award winner for continued leadership in protecting our environment through superior energy efficiency achievements. Servidyne’s accomplishments will be recognized by the U.S. Environmental Protection Agency and the U.S. Department of Energy in Washington, D.C. on April 26, 2017. Servidyne was honored for its long-term commitment to energy efficiency. This is the company’s 15th ENERGY STAR Partner of the Year award, the most for any service provider in the nation, and the 11th time the company has been recognized with the highest honor for Sustained Excellence. We congratulate those of you who achieved 2017 ENERGY STAR Partner of the Year Awards for your own organizations, and thank all of our customers and colleagues for the collaborative efforts toward reducing greenhouse gas emissions and protecting the environment. We encourage everyone to redouble our efforts in support of ENERGY STAR at this critical juncture for the planet. Servidyne provides energy and sustainability consulting in the commercial and institutional building sector. The Servidyne team combines the real-world experience of seasoned professionals with the enthusiasm and fresh perspective of younger engineers, providing solutions for clients that are both practical and forward-thinking. Services include benchmarking and strategic planning, energy audits, retro-commissioning, demand response strategies, energy modeling, investment grade audits, sustainability assessments and LEED® consulting. The company has achieved 13 ENERGY STAR® Partner of the Year Awards is a LEED Proven Provider. Servidyne helps building owners and managers lower energy and operating costs, reduce environmental impact, and enhance occupant comfort.